The company received 9,000 orders for the new model before its official market introduction. VIENNA – FAW-Volkswagen Automotive Co. Ltd., the Chinese joint venture between First Auto Works Group, Volkswagen AG and Audi AG, launches the new midsize Jetta sedan as its new flagship in the Chinese market. 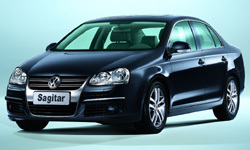 The new car is called the VW Sagitar in China. FAW-VW was forced to look for a new name, as the auto maker builds the previous-generation Jetta/Bora as well, and could not use those model names. The Chinese name for the Sagitar, pronounced ''saw-gee-tar,'' means “fast” or “gallop,” in Chinese, emphasizing the car’s sporty character. The company received 9,000 orders for the Sagitar before its official market introduction. The first two cars ceremonially were handed over to Torino Winter Olympics Chinese gold medallists Wang Meng and Han Xiaopeng. The Sagitar starts at RMB173,800 ($21,714). It is being produced at the FAW-VW plant in Changchun, using parts sourced from Volkswagen de Mexico S.A. de C.V.
FAW-VW also makes the Golf IV and Caddy, as well as the Audi A4 and A6. Over the next three years, both FAW-VW and Shanghai Volkswagen Automotive Co. Ltd. plan to launch 10 to 12 new models. “We will continue to provide customers with new products of the finest craft, best quality and most advanced technology,” FAW-VW President Tiecheng An says. Plans for FAW-VW call for the production of the Passat B6 and a refreshed version of the Bora. Otto Lindner, chairman of VW Mexico, says the facelift for the current Chinese Bora, known as the Jetta in Mexico and the U.S., was developed in Mexico. The facelifted car will be manufactured in “both China and Mexico, he says. FAW-VW, which sold some 221,000 VW cars last year, plans to increase its VW brand sales by 10% this year. The company sold 33,411 VW-brand cars through February, a 40% rise over like-2005. “We expect further growth in the coming months, and we will achieve our defined target to do better sales in the overall year, compared to 2005,” says Winfried Vahland, president and CEO of Volkswagen Group China.